What an incredible evening! Such a whirlwind of cameras, flashes and Champagne, all in aid of an extra special collaboration between the German artist Tobias Rehberger and German Luxury label MCM. Hopefully you have read the first two posts (travelling to Hong Kong and my MCM outfit) regarding my Hong Kong trip and this exciting collaboration, and therefore you’ll already be up to speed. But today was the big event that was a central part of this wonderful trip and we all got to celebrate the MCM party in Hong Kong. 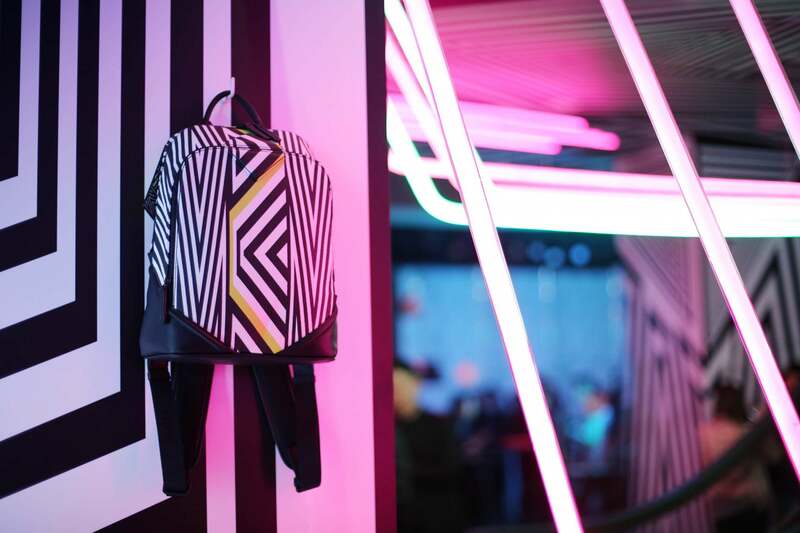 Kitted out with a light and artistic installation by their collaborative partner, Tobias Rehberger, the brand had transformed their Hong Kong store into a cool, neon club. Canapes and Champagne, an RnB DJ Set and a neon lit wall for photoshoots were just some of my favourite parts of this night and I am still so excited to have been a part of it. As soon as we arrived I was led into the venue, photographed by what seemed like hundreds of photographers and seated in the VIP area. I also lost Alex for a small second. But I’m so glad that I also got to meet some of my amazing readers and viewers there too; it really made the night so amazing! I was so annoyed at myself that I only had an hour to shower, curl my hair and get dressed for this event, due to working away on vlogs and blog posts right up to the last second. But, I feel I still managed to just about pull off a red carpet look. 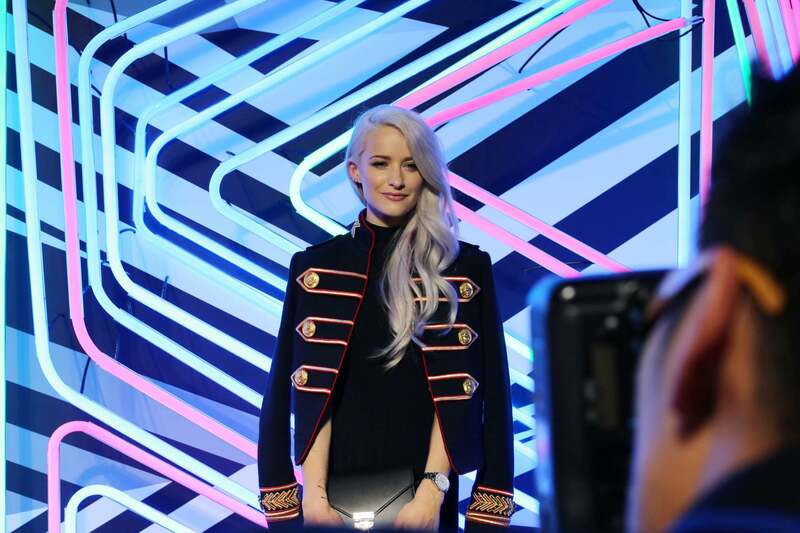 Wearing a ribbed bodycon black roll neck dress, the focus was on this new season MCM military jacket with incredible ruby embellishments and buttons. I wore my hair down and curly to one side, just to add a touch of femininity too, alongside a pair of Valentino Rockstuds for even more sparkle and embellishment. To finish, the medium MCM Patricia handbag in black smooth leather finished off the look and also helped me stuff everything inside it for the night. Except my phone, which I left in my bathroom in the rush! With over 600 people attending the event, it was quite difficult to see or meet many people, but I did spot a few other influencers and models who had been invited along by MCM. Nicky Hilton attended with her brother Barron as well as Hailey Baldwin, who wore a stunning dark red lip and sported an MCM x Tobias Rehberger clutch. I was also able to say hello to the collaborative artist Tobias Rehberger and a number of other Asia based celebrities and media. Let’s just say I couldn’t keep the smile off of my face for most of the evening! And this post concludes the trilogy of Hong Kong posts with MCM. It has been a whirlwind few days, staying in the gorgeous Four Seasons, dining at the top of skyscrapers and attending star studded launch parties. And Hong Kong has quickly become a new favourite city. I would love to return in the future, to take in so much more of this exciting and colourful place, as I know we only scraped the surface with what we saw. It has been an incredible experience and one I would like to extend a huge thank you to MCM for! What an adventure! This post is a Paid for Advertorial in sponsored collaboration with MCM.